It seems strange, but I can’t imagine planning a John Muir Trail hike without a computer. Online maps, bulletin boards with the latest information, even training materials – they are all available with a click and very little (or no) cost. Add another to the list: Cairn. Available only as an app (and only for the iPhone), Cairn does two things very well: it tells you where there is cellular network coverage (and from what carrier), and will allow you to file a “trip plan” with a friend or family member. The first feature could not be easier to use. 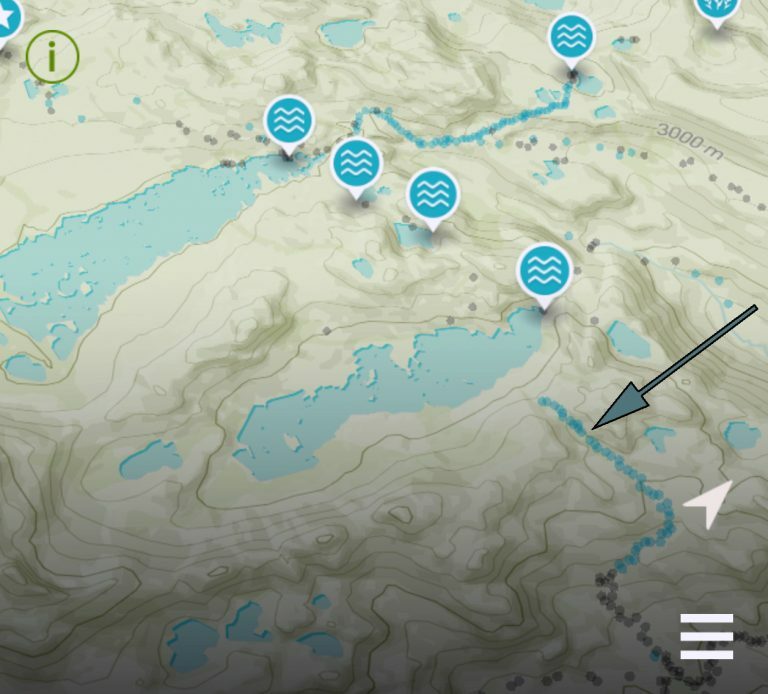 Just download the free app, enter a landmark (I put in Thousand Island Lake), and you will be presented a map that shows the trail and a series of gray and blue dots. Gray dots indicate that reception was tried from that spot, and failed, while the blue dots (see arrow in the photo above) indicate a successful connection. Tap on the blue dot and you will be told what carrier established the connection. You can download the maps before departing for the trailhead, so no connection is needed to find out you are in an area without coverage. As I’ve written about before, I frequently hike alone, so a call to my wife from the woods is a tremendous morale booster for me, and a welcome reminder to her that I am doing fine. The second feature is pretty neat, too, although probably more useful for a day hike than a multi-week JMT trek. Imagine you are doing a local hike in two days. You enter your destination (e.g., a waterfall along the trail), when you are expected to exit the wilderness, and the email addresses for one or more contacts (taken from your contact list already on the iPhone). The app will send an email to each contact you list describing your hike and providing a link to a map. Then, as you hike (and pass through areas of coverage), your location will be updated on the map. Let’s say you are planning an eight-mile hike, and there is coverage at the trailhead, at about three miles in, and at about five miles in. Let’s also assume that you injure yourself at the falls (your turn-around point) and are unable to self-rescue. Since you failed to “end” the trip on the app, an email will be sent to the contacts you specified notifying them that you are overdue. The link in that email will take them to a map that shows you entered at the trailhead, and passed the areas of coverage (once each) at the three- and five-mile point. Search and rescue would then know that you were probably somewhere between the five-mile point and the falls. I feel obligated to point out that no one should depend on electronics for their safety in the woods. Phones break, emails disappear into the ether, and the DoD can degrade the GPS signal if necessary. Speaking of broken phones, I can imagine one potential problem with the system. If you break your phone, there is no way to notify the app that you are safe. Should that happen, make sure you reach out to your contacts some other way so that they do not alert SAR. Interesting app. I suppose there is some redundancy with devices like an InReach in terms of progress tracking, although I only activate my InReach service for the one month of my JMT walk last summer. On the topic of “false alarm” if your phone dies and can’t send a progress update – I found myself facing this with my InReach last summer. For reasons unknown, my InReach screen went black on Day 3 of my hike. The green light was flashing, indicating it had power, but I couldn’t navigate the screen, couldn’t power down, and couldn’t connect via the phone app. By my agreed emergency plan, I realised that I only had ~24 hrs before worried phone calls would start being made. Fortunately I read the small print on the device, figured out there was a “hard reboot” option, and this solved the issue. However, this is an important consideration for emergency plans based on electronic tracking devices – if your device malfunctions (and you are otherwise fine), and you have no other means of sending a message, figure out what your Plan B is going to be before the SAR come looking for you! Thanks for the comment, Lange. Your “Plan B” solution is right on. My wife and I tested out the app the other day, and the “overdue” email that is automatically sent is quite emphatic about not panicking and give some pretty common-sense instruction on what to do next.